Unwanted or unsuitable items can be returned in the original packaging and unused within 14 days of receipt. Only if the item has is original packaging and is unused a refund will be given. In the unlikely case of a faulty or wrong item please return the item to me and I will be happy to replace it or give you a full refund including all postage. Also please email me if you are not satisfied with your item. I will replace it, exchange it or give you a refund!. I will post out the replacement free of charge. Please return to: Funky Soap, Unit 44J, Leyton Industrial Village Argall Avenue London E10 7QE United Kingdom Please state your request and include your details. Free P&P on orders over £50.00 when you buy annikriesche's other eligible items. £0.60 P&P for each additional eligible item you buy from annikriesche. Thank you for your purchase! I hope you enjoy your soap! Please let me know if there are any problems! Unwanted or unsuitable items can be returned or exchanged within 14 days of receipt. 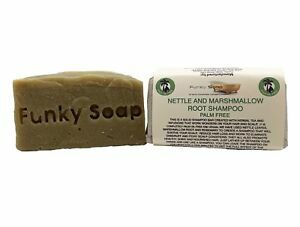 Please refer to the returns and exchange policy on our website: www.stores.ebay.co.uk/funkysoap Thank you!